From Ishigaki island, Okinawa prefecture. Conducting two kinds of “Enka” (a song to cheer municipality, and the ordinary popular style Enka) activities. Municipality songs count up to 300 songs, which proves her strong performance as number one. 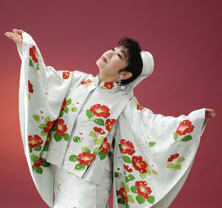 Through her unique tactics to waken the villages minds, Yoko Mine has been referred to as “Queen of municipality songs” and the “Public official singer”, wearing a “Bin Gata (traditional Okinawan fabric design)” dress, performing nationwide concerts as the “Singing Conductor of life”.